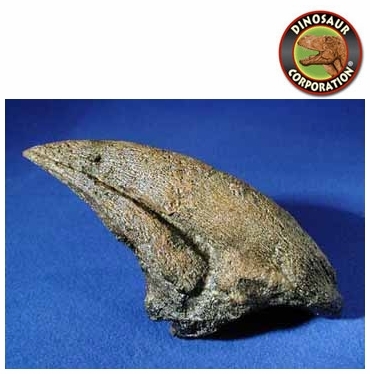 Acrocanthosaurus toe claw from this giant, heavy built dinosaur with massive greatly elongated neural spines. Antlers formation, Oklahoma and Texas. Dinosaur from Cretaceous Period. Although slightly smaller than gigantic relatives like Giganotosaurus, Acrocanthosaurus was still among the largest theropods ever to exist. The longest known individual measured 11.5 meters (38 ft) from snout to tail tip and weighed an estimated 2400 kilograms (5300 lb). Its skull alone was nearly 1.3 meters (4.3 ft) in length. The skull of Acrocanthosaurus, like most other allosauroids, was long, low and narrow. The weight-reducing opening in front of the eye socket (antorbital fenestra) was quite large, more than a quarter of the length of the skull and two-thirds of its height. The outside surface of the maxilla (upper jaw bone) and the upper surface of the nasal bone on the roof of the snout were not nearly as rough-textured as those of Giganotosaurus or Carcharodontosaurus. Long, low ridges arose from the nasal bones, running along each side of the snout from the nostril back to the eye, where they continued onto the lacrimal bones. This is a characteristic feature of all allosauroids. Unlike Allosaurus, there was no prominent crest on the lacrimal bone in front of the eye. The lacrimal and postorbital bones met to form a thick brow over the eye, as seen in carcharodontosaurids and the unrelated abelisaurids. Nineteen curved, serrated teeth lined each side of the upper jaw, but a tooth count for the lower jaw has not been published. Acrocanthosaurus teeth were wider than those of Carcharodontosaurus and did not have the wrinkled texture that characterized the carcharodontosaurids. The dentary (tooth-bearing lower jaw bone) was squared off at the front edge, as in Giganotosaurus, and shallow, while the rest of the jaw behind it became very deep. Acrocanthosaurus and Giganotosaurus shared a thick horizontal ridge on the outside surface of the surangular bone of the lower jaw, underneath the articulation with the skull.